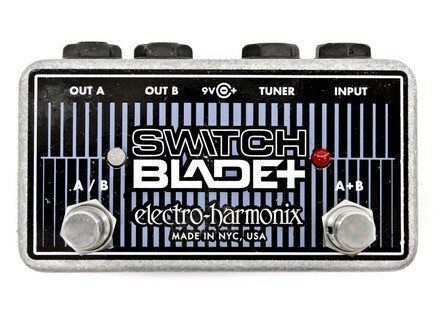 Switchblade+, Pedal/Controller from Electro-Harmonix in the Switchblade series. With a passive audio path and active LED indication, this new pedal is designed to offer a solution to a player’s switching needs. The Switchblade+ allows a musician to switch his signal between two different locations (A or B). This permits toggling between two amps, two effects chains or two speaker cabinets. The pedal also enables the player to send a signal to both destinations at once, i.e. A and B. The Switchblade+ also provides a dedicated output which can be used for a tuner or other effects pedals. This Tuner output jack is hardwired to the Input jack and provides a direct output regardless of the state of the unit. The Switchblade+ is shipped with a 9 Volt battery that provides power for its indicator LEDs. It can also accept an optional 9VDC battery eliminator such as EHX’s 9.6DC-200BI. Since the audio path of the Switchblade+ is fully passive it will work without power, however, the LEDs will not function. 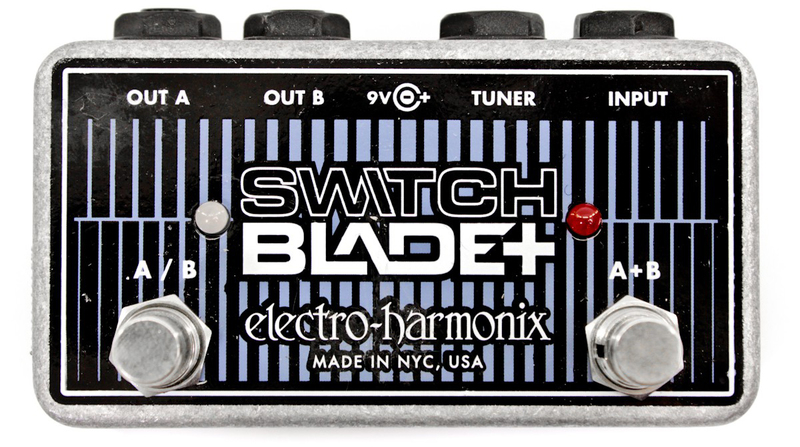 The new Switchblade+ is housed in EHX’s rugged, cast NANO package. It carries a list price of $63.20 and will begin shipping late November, 2011. Electro-Harmonix Analogizer The new Analogizer is designed to provide the organic tone and feel of an analog delay, without the long delay times. Fender 72 Telecaster Thinline In celebration of Coldplay’s recently released album Mylo Xyloto, Fender announces the Coldplay Guitar Giveaway. Patch editor for the Lexicon MPX G2 "Lexi" is working on a patch editor for Lexicon MPX G2.